So, the builders have been gone for more than a week and peace reigns in the garden… at least it does when Mr Snail is not cursing the willow hedge, which he is in the process of subduing. And so comes the task of restoring the garden to being a productive space and filling the limery with plants to feed the soul and the stomach. Normally at this time of year I am bemoaning a glut of something or other… but not now… currently it’s all potential plus a few potatoes and mange tout. It’s probably good for me, as I’ll appreciate the produce all the more when I do have it. However, there is lots of potential… plus I am loving spending time in the limery (where we had a game of Scrabble late yesterday evening). First I should mention this lovely orange tree. Our rather sad lime tree (recovering its leaves now), after which the limery is named, has this rather splendid citrusy companion thanks to one of the glaziers. Over a cup of tea on the first day the glaziers were here I told them of my plans for the limery. One of them was particularly interested in what I planned to grow in it. When I told him of my ideas he asked whether I had considered growing oranges. On hearing that I’d love to, he offered me an orange tree – it had outgrown his dad’s little greenhouse and was in need of a new home. So a couple of weeks later he returned with the splendid specimen. Apparently it has produced small oranges in the past, so I have high hopes for it in its new abode. Being keen to use the height of the limery as well as the floor space, and wanting to add beauty as well as productivity, I decided that I would have at least one perennial climber. My choice: a red banana passionflower (Passiflora antioquiensis). Suppliers are few and far-between in the UK and the only one who I could find to order from stated that plants would not be dispatched until October. However, this was the species I had set my heart on, so I placed my order and expected to wait a few months. I was astonished, therefore, to receive a parcel after just a few days. 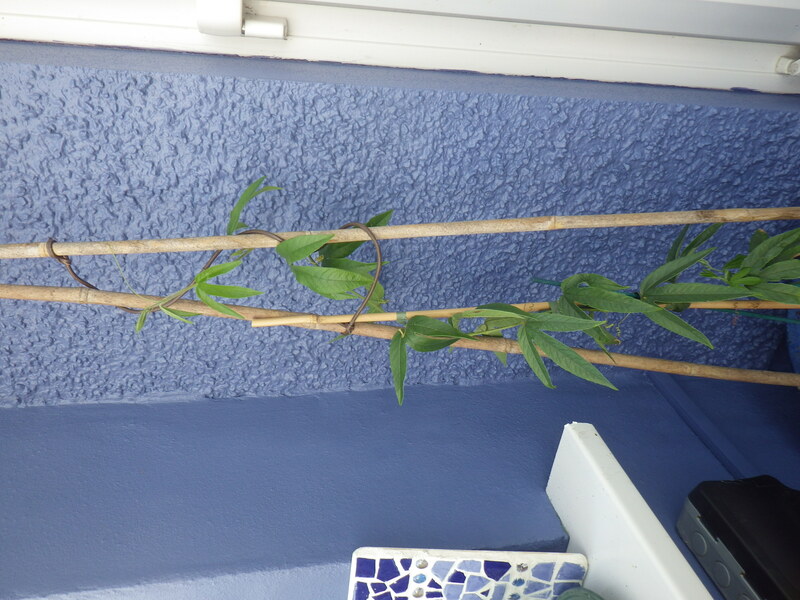 I thought that they must have sent me just the second plant in the order (a blue Clematis), but no – the box contained both. And so, the limery is already graced by a small passionflower, that’s already on its way up. Once we’ve decided on its final location, we’ll put some wires in place for it to hold on to. That is so true – the peace is much appreciated and then indoor garden already feels lovely. 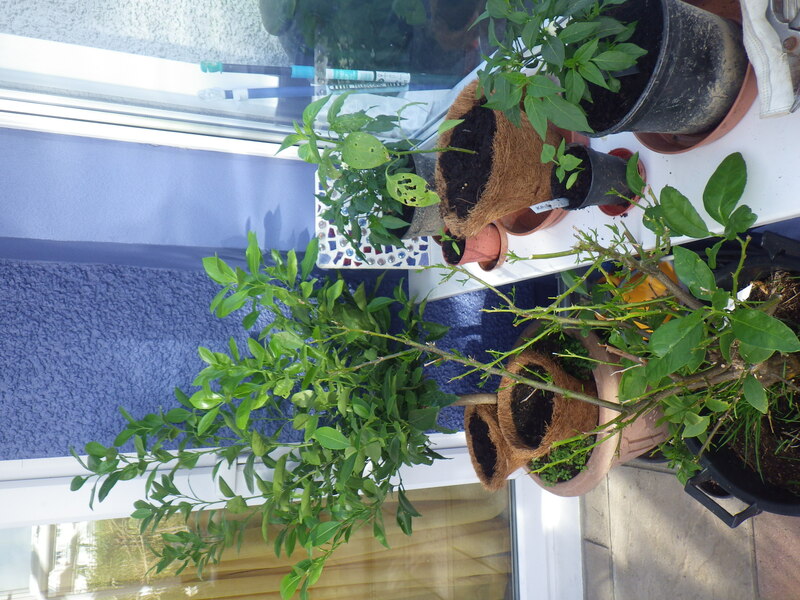 Something to maybe bear in mind: Many years ago when I lived in the near tropics of Hawkes Bay and had a half acre and was planting citrus trees i was told not to plant them too close together or they would affect each other’s fruiting abilities. I never got round to finding out if this were really so [no internet back then!] or just an urban myth so to speak, but I did notice that the lemon and orange that grew side by side tended to more pips and less juice than the other trees that were spread further apart………….. Just thought I’d mention it in case…………..
Interesting… I will make sure the lime and orange don’t get too cosy! It seems the limery is filled with possibilities right now. Only the ceiling is the limit. I’ve wondered about citrus being grown indoor. I would live to grow my own oranges. We get too cold for them outdoors. It’s nice you can enjoy the space for so many things. The green against the blue is sublime. You have created a lovely slice of heaven. I am so pleased with the blue – we dithered quite a lot about what colour to go for and we did wonder whether this might be a bit too dark, but it looks good in the very light space. Ah, I can but dream! My own little jungle perhaps! Your Limery is not only a darling little space, but becoming a very productive one too. 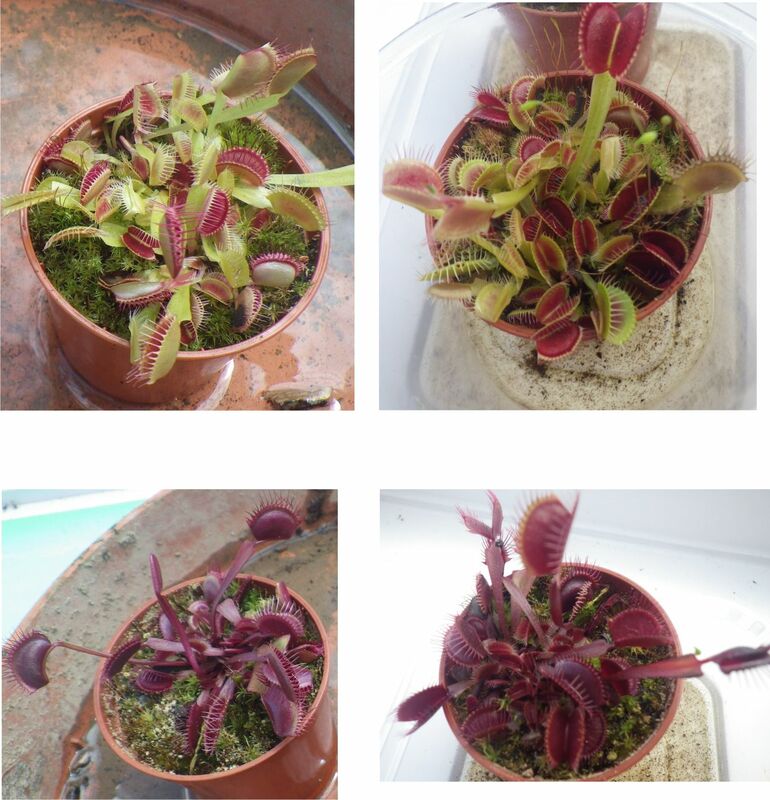 It wasn’t until I looked closely at the last photo that I realised your carnivorous plants are quite small! I’m so glad everything is coming together. There will be much more and many plans. It’s also really nice that you have adopted the orange tree. I bet the former owner feels good about it–and hope that you get some oranges. katechiconi Passion should never be subjed! I look forward to hearing more about how everything grows as this progresses. Our one Citrus is outside at the moment, having nearly been killed off over the winter but has put out new shoots from the base which are doing well. We still don’t know what it is as it was grown from a pip by someone else. I think it is about 15 years old so hopefully we will see some fruit on it within another 5 years! How incredible that this has all come together so well and you’re able to sit back and grin at it! I have particularly enjoyed viewing it over the rim of a beverage – you get a different perspective with a cup of tea or glass of wine! I’m glad to hear your planning to put the citrus outside in the summers. I was a bit worried the carnivores would eat all the pollinators. Of course, you could pollinate them yourself. Not sure what that involves. Hehe… just so long as the carnivores don’t get a taste for fruit! !